Looking for a bargain – Dressage and Jumping saddlepads discontinued colours. The elegant saddle cloth Glossy Glam with a high-quality glossy outer woven fabric and medium padding. With Heritage lettering on both sides and double cords. 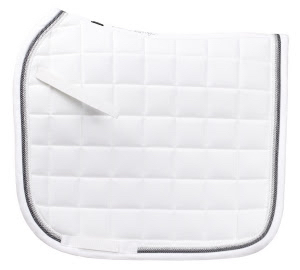 The silicon areas ensure that the pad remains in a good, secure position under the saddle. The inside is made of a Cool-Dry lining for optimal breathability. Limited Edition! Quality small quilt design cotton saddle cloth. Suitable for embroidery. Tired of dealing with unsightly torn plastic holders? Hamag Leather Number Holders™ are handmade here in Australia from quality materials, and have been designed to last a lifetime. And we mean it when we say that they WILL NOT fall off! As seen on such international riders as Steffen Peters, Mary Hanna, Brett Parbery, Rozzie Ryan and many more, Hamag Leather Number Holders™ have become the gold standard in both form and function. Our saddle cloth number holders include a heavy-duty pin for easy attachment to your favourite saddle cloth. Standard dimensions are 11 x 8 cm. Stylish new saddle cloth from Lauria Garrelli, HKM. Double gold braiding with Lauria Garrelli emblem, we have the Golden Gate range available in Deep Blue, Chocolate Brown , Taupe plus Orange. The fit has cut back shape which allows space for the wither whilst avoiding pressure on the delicate area of the shoulders and wither. The outstanding shiny finish, colour pallet and cord trims has been precisely chosen by the SD Design team to bring you an modern and elegant range. The thoughts behind the Secret Shine collection were to make a very beautiful design with an elegant look added a touch of sparkle. Classy premium saddle cloth with a a glittering braiding and feature rhinestones. Functional lining ensures breathability with even pressure distribution. 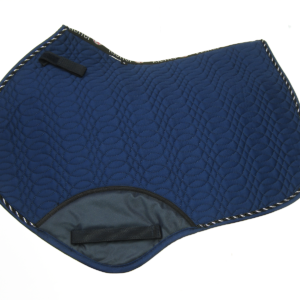 Classy, premium saddle pad featuring a glittering piping. Set with additional rhinestones along the quilting this saddle pad proves a real eye catcher. 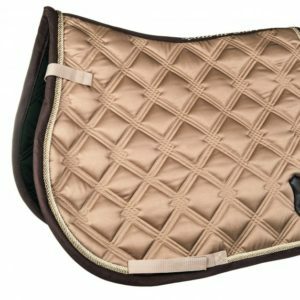 Anatomically shaped saddle pad featuring a unique quilting. The pad”s padding ensures greatest moisture absorption, 380 g/m² padding and 8 mm foam for excellent pressure distribution and shock absorption. 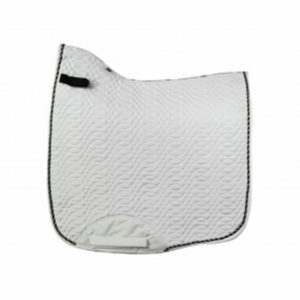 The ANKY Saddlepad Jumping features the very latest in innovative materials. The exterior is a tactile suede while the interior is Coolmax and assures optimal moisture management. The thick technical filling ensures that the pad will remain perfectly in place. The new Kieffer saddle cloth features a high, contoured wither, designed for optimum comfort. A generous cut suits large horse, while a close quilting pattern creates the ideal surface for logo embroidery. Also available in Jumping cut. Four colours – Navy, White, Black and new colour Grey.